There's a little jewel nestled next to Golden Gate Bridge, in the San Francisco Bay Area - The Bay Area Discovery Museum. 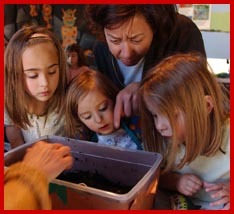 A nationally recognized learning center for children, their families and educators, the museum offers indoor and outdoor hands-on interactive art, media, environmental and science activities and exhibitions, theatre programs, cultural festivals, school programs, summer camps, and parenting workshops. Through these offerings, the Bay Area Discovery Museum strives to achieve its mission: "to engage, delight and educate children through exploration of and connection with the local environment and the diverse communities that live here." The museum opened in 1987 in a small storefront space by a group of community leaders who envisioned a cultural institution for children based on a new model of inquiry-based learning, particularly for younger children ages 10 and below. Based on its great popularity in the early years, the need was evident for the creation of a major children's museum in the Bay Area. In 1991, the museum moved to its current location at Fort Baker, occupying nine renovated army buildings. Since 1991, the museum's programs have continued to attract a growing audience of residents and visitors to the area. With rotating exhibits and special events the Bay Area Discovery Museum is a "must-visit" on any family's itinerary. Discovery Theatre: The new 180-seat performing arts theatre, combined with the Museum's collaboration with ODC/San Francisco and Berkeley Repertory Theatre, greatly enhances the performing arts curriculum and permits a full range of educational and cultural offerings. Tot Spot: The new and improved Tot Spot offers crawlers, early walkers, toddlers and preschoolers a multi-sensory experience as they explore exhibitions themed around animal homes and habitats. Outdoor Tot Spot: Expansion of the popular Tot Spot includes the addition of a new outdoor exploration area that will allow toddlers to explore animal habitats of the woodland, creek and meadow and make the connection between their home and the homes around them. Media Clubhouse: Geared toward children 6 and up and their families, the new Clubhouse features technology-based programs in art and science. Children, school groups and camps explore new games, stories, art programs, music, computer animation, video projects and more on a variety of multimedia equipment. 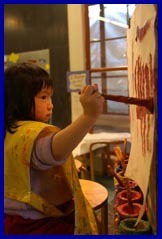 Art Studios: More than doubling the size of the previous Art Lab, Studio 5 (for ages 5 and under) and Studio 10 (for ages 6 and up) offer drop-in programs as well as opportunities to work with artists in a wide variety of mediums in the visual arts. Ample workspace is provided for school groups, teacher education and summer camps. The Art Studios offer special ceramics classes and drop-in labs encouraging children to sculpt and glaze their own masterpieces. 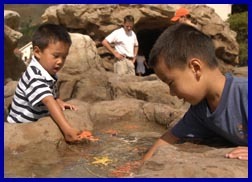 Lookout Cove: This new 2.5-acre outdoor, interactive exploration area features natural, cultural and built icons of the Bay Area including a rocky shore and sea cave, a shipwreck with clues to dig up and discover, the Golden Gate Bridge under construction, real water tidal pools, native animal homes to build, and more. The space also features five site-specific artistic works commissioned for the Cove. Wave Workshop: The Museum's new science lab will re-create the dynamic environment under the Golden Gate Bridge and teach visitors how organisms adapt to live within such an environment. Part of the Wave Workshop will include an area where children can conduct hands-on experiments, handle live animals and preserved specimens, explore new worlds, and learn to use scientific instruments under the guidance of science educators. San Francisco Bay Hall: A playful simulation of the Bay Area with an "underwater" tunnel, 300-gallon sea star tank, fishing boat and Fisherman's Wharf. Aaarrrrrr! There's a bounty of fun to be had as members of Active Arts Theatre roam Lookout Cove seeking families to enliven their stories of adventure and mischief. Come dressed as a pirate and enjoy $1 off admission! Sun Drummers of Urban African Ensemble fill the air with electrifying beats while Pacific Sticks shows you how to make percussion instruments using recycled materials. Bring your own drum and enjoy $1 off admission! Got the need for speed? Race on over to the Museum for an up-close pole position with a real racing car, and kick your creativity into high gear to help us paint an old car! Come wearing your coolest shades and enjoy $1 off admission! Environmental vaudeville comes to town with juggling, music, circus antics, storytelling and comedy. Auntie Stacy the Face Painter will also be hanging around to paint your face like a clown! Come in clown costume and enjoy $1 off admission! Swing by the Museum and meet the Oakland A's mascot, Stomper. Come in your favorite team gear or little league uniform and enjoy $1 off admission! Benny the Wizard, and his sidekick Bebe the Impish Clown, invite you to the Wizard School of Magic and Science! Auntie Stacy will be here, too! Dress as your favorite Harry Potter character and enjoy $1 off admission! August 6: "Under the Sea Day"
Discover our Bay with the Marine Science Institute and its rocky shore animal friends - live and up close! Bring your aquatic stuffed animal and enjoy $1 off admission! August 13: "Surf's Up! Day"
Who needs Maui when you can catch a wave of fun at the Discovery Museum? Hang-10 while enjoying beach music and plenty of summer sun. Kowabunga, dude! Wear your beach attire or Hawaiian shirt and enjoy $1 off admission! August 20: "Classic Rock Day" with The Sippy Cups - Milk, Music & Mischief! Kids of all ages will enjoy an unexpected mix of kid-friendly tunes by the Beatles, Velvet Underground, T.Rex, Pink Floyd, the Kinks, Ramones and more! Children can join the band on stage, while a circus performer makes mischief! Don your tie-dye and enjoy $1 off admission! August 27: End of Summer Celebration! Coast through the final days of summer as The Bluegrass Contraption performs two shows (at 11 a.m. and 1 p.m.) of traditional folk, fiddle and bluegrass tunes loved by children everywhere. Don't miss tot-favorite Music Together with Stacy at noon! Wear something blue and enjoy $1 off admission! The museum is open Tuesday through Friday 9 a.m. to 4 p.m.; Saturday and Sunday 10 a.m. to 5 p.m. General admission is $7.50 per child, $8.50 per adult person - free for members and children under 1 year old. The Museum offers free admission on the second Saturday of each month from 1 p.m. to 5 p.m. The museum is located at Fort Baker; 557 McReynolds Road, Sausalito, California. The telephone is (415) 339-3900. The website is baykidsmuseum.org . 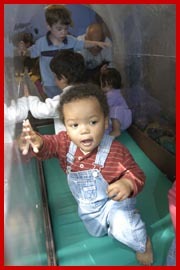 For more on family fun in San Fransico click here.